When you hear people talk about their meditation practice you often hear them talk about the space that they are in as "their sacred space." This is often a location that they feel most comfortable in.. Maybe they visit this space or maybe they have created this space. This space can be either, but don't get overly hung up on this. This doesn't make or break your meditation practice or your ability to meditate. If you are someone who wants a meditation space, a space of your own, or a sacred space in your home here are some wonderful ways to go about doing that. As I have said I meditate on the floor in my kitchen. I also mediate in my bedroom, on mountains and at yoga studios so I never limit my ability by tying it to a location. However, I have multiple sacred spaces created throughout my home. My home is my sacred space. It is my Spa in the world. At one point in time all my friends called my house "Spa Becky" because when they walked through the door they knew they would feel at ease, they would find peace, and they would have the tools to care for themselves at their finger tips. I have kept this practice up and this still rings true in my home. I will share how I create these spaces and what I have in them. When you think of a space to hold your meditation what comes to mind? For me personally I think of a calm, quiet, blissful space. Now in real life my home has this, but I also have two tiny humans who effect that space and put their energy into that space. So, I have created a few spaces throughout my house so I can pick and choose what suites my needs at that time and they can too. A space I love to spend time in is an over stuffed chair that is on my sun porch. This chair sits so it faces out the windows and looks back into the house. Catty cornered in a way that makes the space feel huge but comforting at the same time. I like this space because it is quiet, naturally lit, and has a beautiful view of my gardens. I can sit in the chair and meditate or I can pull the giant pillow to the floor and meditate on it depending on the mood I'm in. Space two is my bedroom. I make sure that everyday the first thing I do is make my bed, then I sit down and meditate. My room has very few things in it, because it is a space for me and my husband to be present with each other and ourselves. We do not have a television in our room. We also don't bring our cell phones in our room. We prefer to make this a WIFI and electronic free zone (The boys room is the same in this aspect.) We have our bed, two lamps, and two side tables. We have a salt lamp, a sound machine, and some crystals. And I have a small rug on floor next to the bed. Other than that we really have nothing else in the room. You will find the more you get to know me, I am a less is more kind of gal. This makes for easy cleaning, for a sense of ease as there is no clutter, and a spa like feel, because all the items have been carefully selected to support us and our needs. This makes for a great space for meditation. Another space in my home is a porch swing that hangs at the bottom of our stairwell. It is right in front of a window that looks out into the back yard. It is a quiet space were I can sit and meditate or read away from the rest of the house. I love this space because even when it is raining or snowing I can relax with nature and swing. Your spot doesn't need or have to be extravagant, remember one of my daily meditations takes place on my kitchen floor, but if you keep it electronic free, clutter free, and incorporate nature in some way you will find that bliss will naturally happen. Again think of what makes you calm, happy, and blissful for a space and start there. Also don't compare yourself to others. It is okay to love someones meditation space, but if it doesn't work for you and your practice that is okay too. Our goal is to CREATE YOUR SPACE. Space: Open, electronic free and clutter free is best and allows for energy to flow and for the mind to be at ease. Some people say that the ambiance is everything! Well they aren't completely wrong. In my personal meditation practice I like to use natural light whenever possible. If natural lighting is not an option I like a soft low light. It is just more soothing. But what if your in an office or a space where you can't control the lighting? Well I say just go with it. Close your eyes and imagine the lighting being perfect. Make it exactly what you want it to be. If you can control the lighting great! Maybe enhance the natural lighting with some mirrors. Or add some low lighting so that the light is calm and gentle. I love salt lamps and crystal lamps for this. It is recommended that your space has windows to let in natural light but if that isn't possible or the windows don't let in enough light? You can get a natural sunlight simulating lamp. They also have special sunlight light bulbs which are all great options. Of course the time of day you choose to meditate will also effect this. 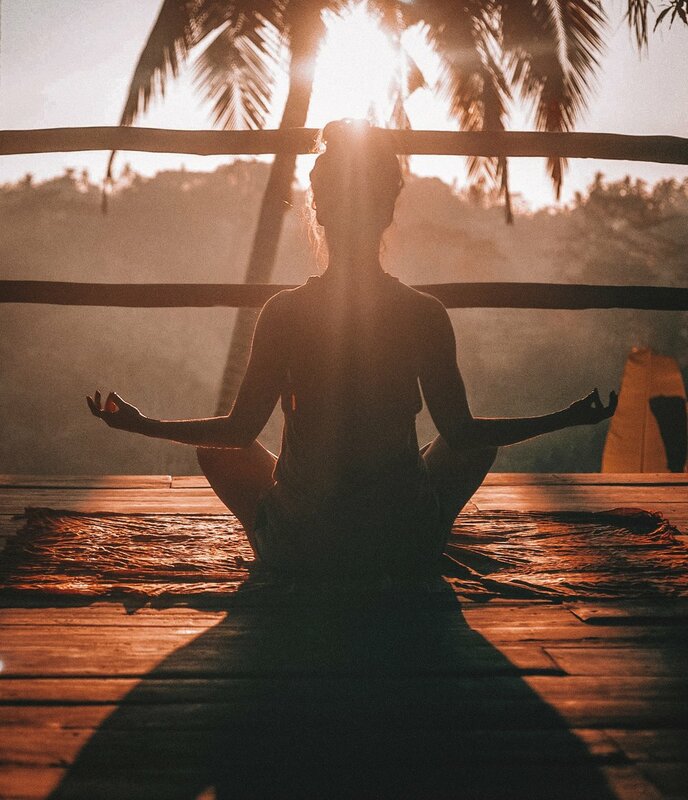 Personally I meditate when I first wake up sitting on my bed with natural light, at 2PM EST on my kitchen floor with natural light, and again in the evening this one I usually sit in my chair, swing, on my porch or on my bed. SO the spaces you mediate can change and the more "sacred spaces" you can create the better. You have your space. The lighting is perfect. Now what? So time to add some supporting tools to create the feel you want. As this is your sacred space and it should support you in your meditations, mindfulness practices, and time of relaxation. We want to only have tools that will support what you will be doing in this space. One thing many people love to have is a big pillow to sit on. A meditation pillow can be key as you extend your practice, but I also know many people who opt for a mat or the floor. That is all personal preference. Which you can always change as your practice grows. I love to light candles. They can be great for ambiance in your space by creating a beautiful glow and a nice aroma. They can also be a place for you to focus your attention while you meditate. You can watch the flame while you hold intention. You can also make an intention while you light or extinguish your flame. Other items for focusing your attention to or to decorate your space in can be flowers and statues. There are so many beautiful prayer statues that make great additions to any meditation space. Honestly, I love to have potted plants in my home and in my space. They smell great, they create their own energy, and they help clean the air and energy in the area they are in. All good things if you ask me. Smell can be very helpful during meditation many people enjoy burning incense, sage or diffusing essential oils during their practice. Crystals are one of my favorite tools. You can use them as decorative accents and as tools for your meditations. Phrenite, angelite, serpentine, ocean jasper, howlite, amethyst, golden calcite, kyanite, clear quartz, and selenite are all great crystals to help support you in your meditation practice. There are many crystals that can be used for meditation. A heads up some crystals that are great for one person may not be the best choice for you. 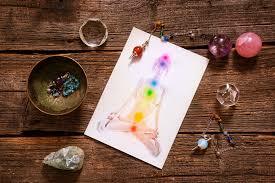 You may need to play around with them or if you have a pendulum you can muscle test what crystals are right for you. I can teach you how to do this. Other things people enjoy having in their sacred space is their space clearing tools. You may want to have access to a drink during this time so you may want to keep a delightful cup of tea or a bottle of water in your space. I'm excited for you to connect with yourself and to create a blissful space for you to meditate. Enjoy! Feel free to share your space with me on social media or ask me questions. It is very exciting and so worth it to take the time to create your own sacred space.